MAPS™ UMTS Gn Gp Interface Emulator Software Ver 8.11.20 (64-bit Only) | Download Now! GPRS and UMTS are evolutions of the Global System for Mobile Communications (GSM) networks. GPRS is a 2.5G mobile communications technology that enables mobile wireless service providers to offer their mobile subscribers with packet-based data services over GSM networks. Common applications of GPRS includes: Internet access, intranet/corporate access, instant messaging, and multimedia messaging. GPRS is standardized by the Third Generation Partnership Program (3GPP). Gateway GPRS Support Node (GGSN) — A gateway that provides mobile cell phone users access to a public data network (PDN) or specified private IP network. 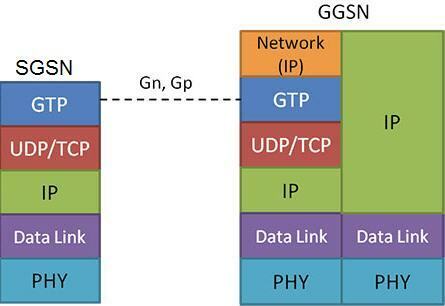 The GGSN feature provides both the 2.5G GPRS and 3G UMTS GGSN functions. 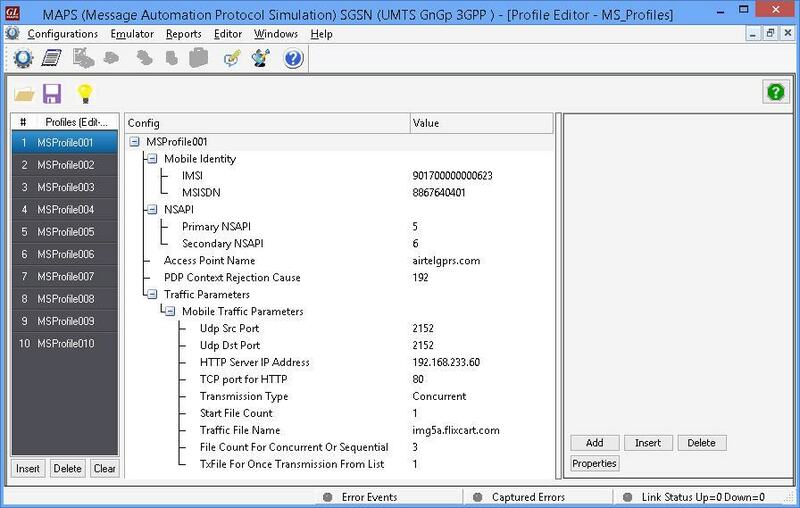 Serving GPRS Support Node (SGSN) — connects the Radio Access Network (RAN) to the GPRS/UMTS core and tunnels user sessions to the GGSN. The SGSN sends data to and receives data from mobile stations, and maintains information about the location of a mobile station (MS). The SGSN communicates directly with the MS and the GGSN. GTP (GPRS Tunneling Protocol) allows multi-protocol packets to be tunneled through the UMTS/GPRS Backbone between GGSN and SGSN. 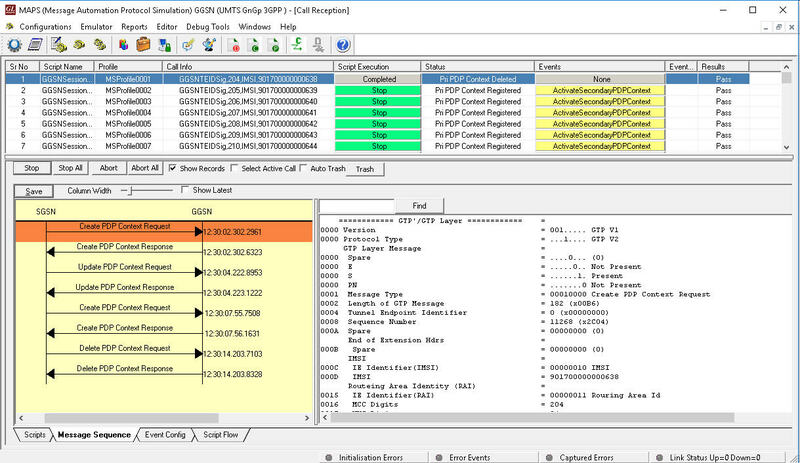 GL’s MAPS™ Gn Gp Interface Emulator is an advanced protocol simulator/tester for GTP simulation over Gn, Gp interfaces that can simulate GTP messages and signaling specification as defined in 3GPP TS 29.060 GPRS Tunneling Protocol (GTP) standard. The tester supports testing network elements SGSN and GGSN, error tracking, regression testing, and load testing/call generation. It can run pre-defined test scenarios against GTP interface test objects in a controlled & deterministic manner. 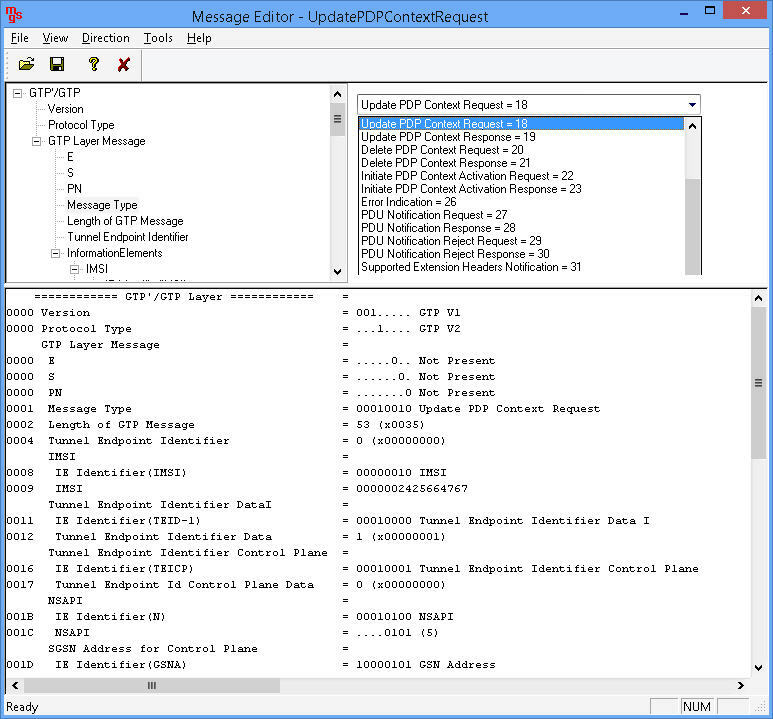 GTP Interface Emulator supports powerful utilities like Message Editor, Script Editor, and Profile Editor which allow new scenarios to be created or existing scenarios to be modified using GTP messages and parameters. By mimicking real-world customer behavior in lab environments, our solutions allow mobile operators and equipment manufacturers to verify their wireless networks before deployment. In other words, one can setup a virtual real-time network simulating all the network elements using “MAPS 3G Wireless Lab Suite”. 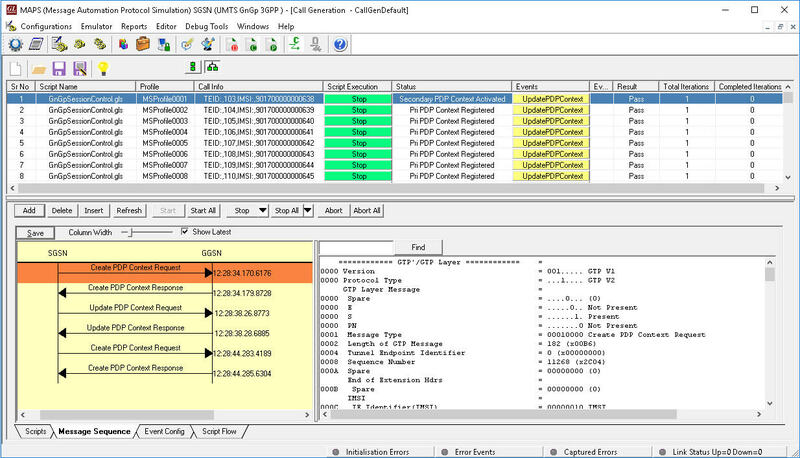 The test suite supports simulation of IuH, IuCS, IuPS, C/D/Gr/Gd, and GnGp interfaces. The product supports Mobile traffic core – GTP (ETH101) simulation for user-plane packet transmission and reception services between any two nodes in UMTS networks. Mobile Traffic Core – Gateway (ETH102) module allows simulation of Gateway Traffic to test media gateway telephony interfaces over IP. These modules also support generation and verification of data traffic such as Email, FTP, Web (HTTP), Video, and more. MAPS™ GnGp Server with PacketLoad appliance supports massive simulation of UEs (up to 500000) with high-volume user-plane mobile data traffic simulation (up to 4 Gbps or 40 Gbps) for both UMTS, and LTE networks. Generates hundreds of Control Signaling (Load Testing). Generates and processes GTP messages. High-volume user plane traffic simulation possible with support of Packet Load appliance; both 4Gbps and 40Gbps variants are available to suit customer needs. Auto generation feature allows Massive UE simulation for high density load testing. Insertion of impairments to create invalid messages. 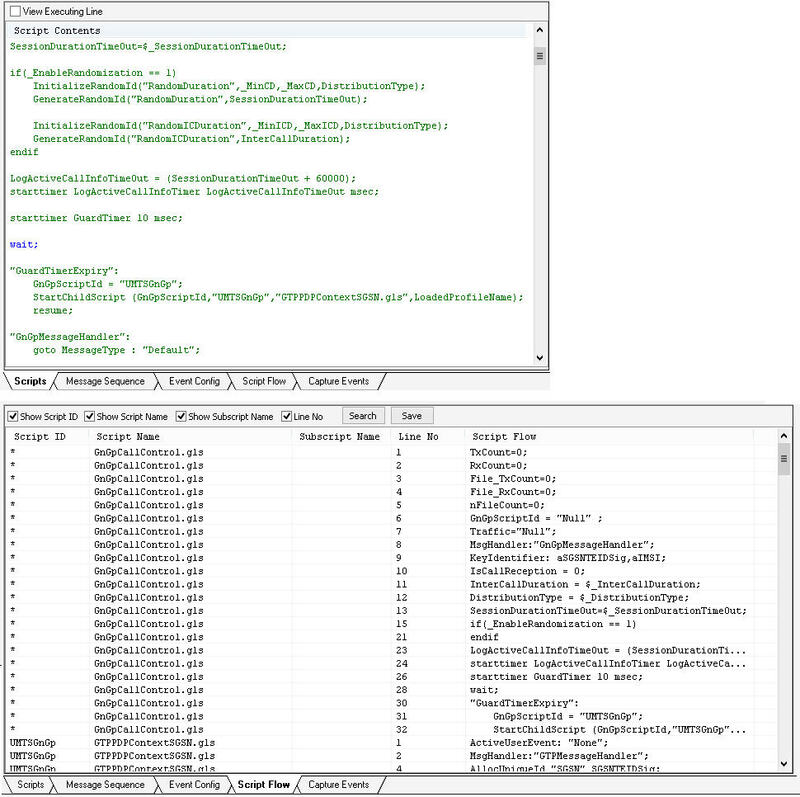 Supports customization of call flows and message templates using Script and Message editors. Supports scripted call generation and automated call reception. Script based & protocol independent software architecture. Provides Call Statistics and Events Status. QoS requests for greater or lesser bandwidth. 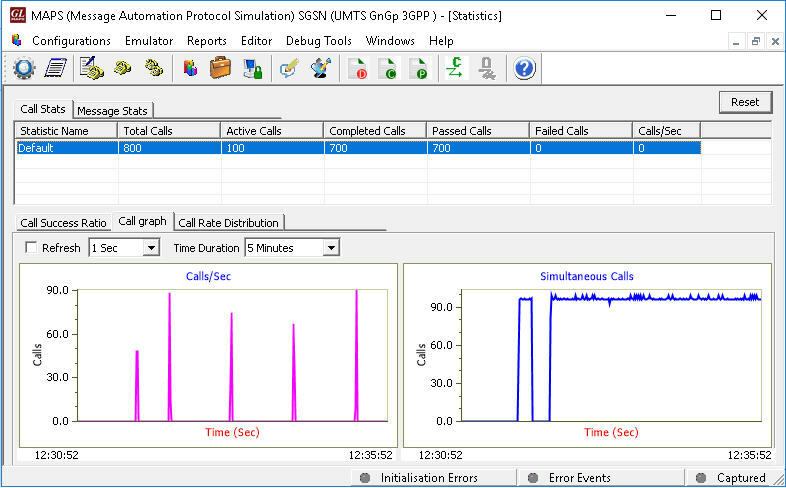 The UMTS Gn Interface Emulator simulates GTP signaling messages between the SGSN (Serving GPRS Support Node), and GGSN (Gateway GPRS Support Node) nodes. 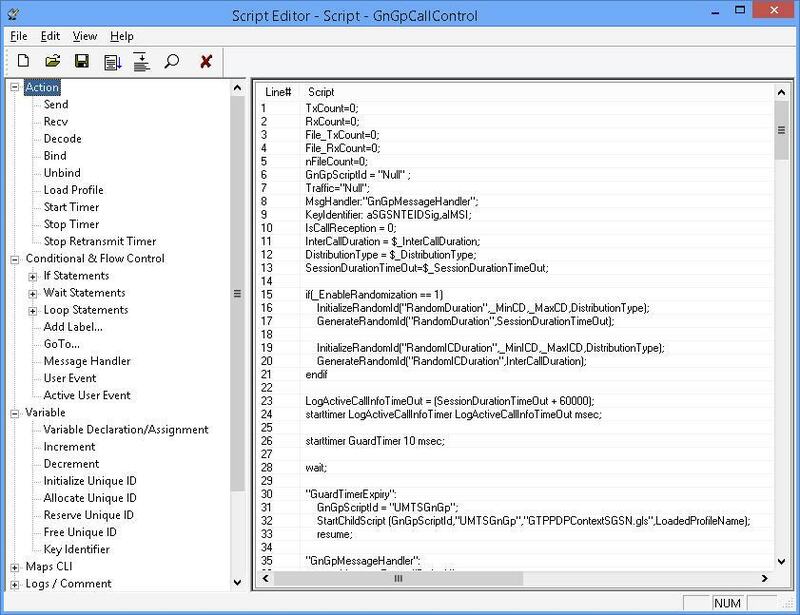 The call control scripts can also automatically handle the traffic over the established call. 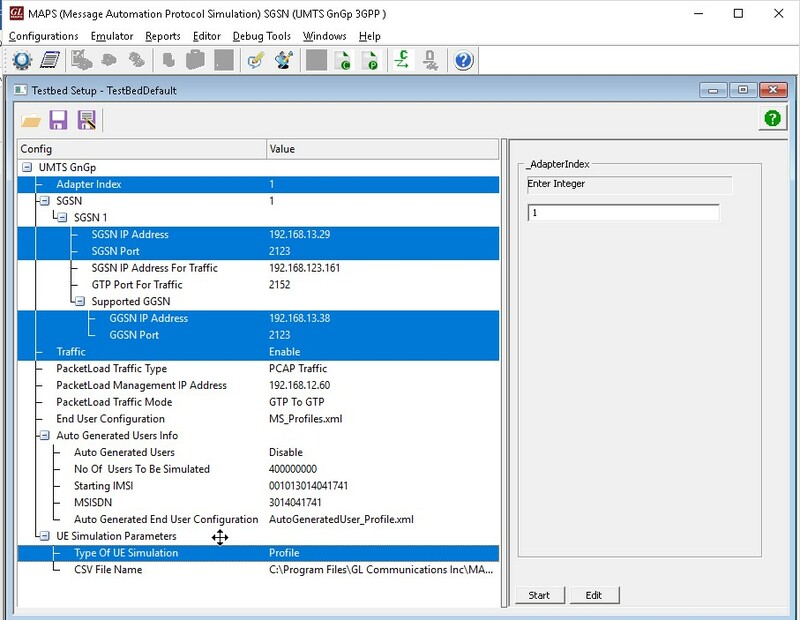 MAPS™ supports transmission and detection of various traffic types over IP (RTP, GTP), ATM, & TDM - such as, digits, voice file, single tone, dual tones, fax, sms, email, http, ftp, IVR, audio and video quality. MAPS™ also includes support for wide range of codec rates – visit traffic-simulation and voice-codecs webpage for more details. User Defined Statistics - Users can customize the global statistics for RTP audio and video traffic. These global parameters are defined in the call generation scripts, which are calculated and updated periodically on run time.